The ARROW460-Granturismo is the first motor yacht from Silver Arrows Marine, a company founded by a group of yachting industry professionals with a long-held dream to use the power of innovation and technology to reinvent the 14m motor yacht. The Collection is comprised of a series of stunning finishes, allowing owners to choose their colour scheme in the way they choose the colour of a Mercedes-Benz automobile. The first to be available is the seductive White Pearl. 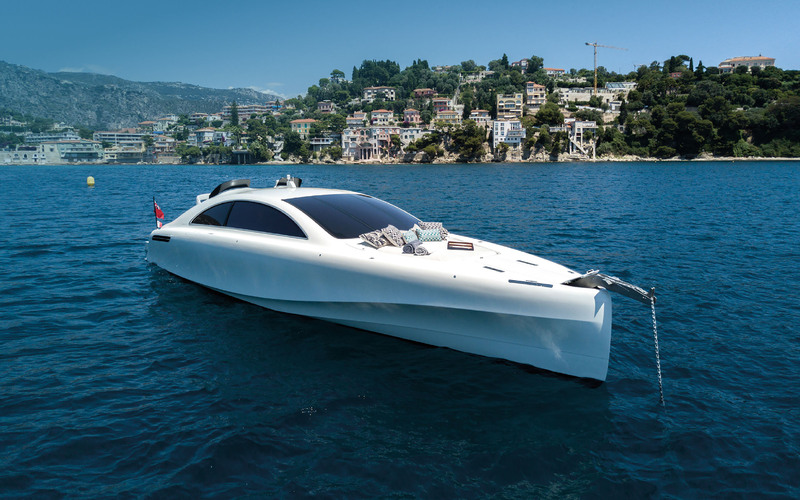 Showcasing a new and automotive-inspired design language, the yacht combines innovative marine engineering with inspirational solutions, executed with the bespoke craftsmanship of a superyacht. ARROW460-Granturismo has been created in partnership with Mercedes-Benz Style – the design arm of Daimler AG – and introduces to the marine world car-inspired design, a highly contemporary interior and unique-in-class features. The result is a completely fresh interpretation of the 14m luxury motor yacht – and a stunning design statement at any port in the world.